Technology is stuck. It’s stuck while an overcrowding, polluting, beheading, virus-spreading planet needs the kind of breakthroughs that reorganize life and create a clear before and after. Where is the next-generation car, airplane, computer, television, atomic bomb or Internet? This is not trivial. If technology is stuck, the human race is stuck. Societies can support more people and keep improving lives only by creating ever more complex systems, and those systems need the occasional breakthrough to leap forward. Recent events show what a pickle technology is in across the board. Start with the crash of Virgin Galactic’s SpaceShipTwo. The Wright brothers first flew in 1903. Boeing introduced the 707 jet airliner in 1958. Since then, we’ve gotten only incrementally better at moving people around. The Dreamliner is to a 707 what a Five Guys is to the first McDonald’s. Richard Branson would like to build an everyman’s way to travel to space—or from London to New York in 45 minutes, via orbit. Virgin Galactic’s SpaceShipTwo began to push that envelope. It flew safely 34 times. It crashed on the 35th, a grim reminder that there won’t be any better way, anytime soon, to get from New York to L.A. other than a six-hour flight with nary a moment of weightlessness. “Space is hard,” Branson had to admit. 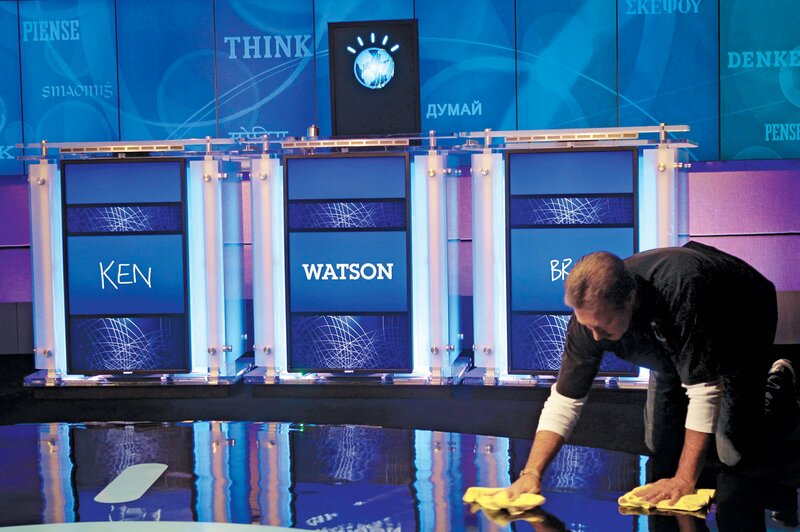 At the end of October, IBM held a conference on cognitive computing. Many of the 300 attendees agreed that computing is stuck. “There’s been one paradigm for 60 years of computing,” said Jeff Hawkins, who invented the PalmPilot and is now working on brain-inspired computing. Today’s computers work the same basic way as the first programmable computers of the 1950s did. We’ve been able to make computers radically faster and smaller, but we’re nearing the end of possible improvements. Building a better computer is becoming like trying to build a better sock. Even worse news: The conference made it clear that no one yet knows how to create such a breakthrough, new-era, society-changing computer. IBM talks of cognitive computing based on its Jeopardy-winning Watson machine, but that’s more like a sophisticated hack of traditional computers than a new way to solve problems. Hawkins pitched a system called Hierarchical Temporal Memory, which he’s been working on at his company, Numenta, for almost 10 years. It would create computers that no one would program—instead, they’d soak up outlandish amounts of data and use it to learn on their own. Other speakers had other ideas. The crucial thing missing was consensus. Hawkins called the situation “messy,” and added: “We’re witnessing the birth of machine intelligence. By the end of the decade, we’ll settle on a new computing paradigm.” We need to hope he’s right. In June, electric car company Tesla did something radical: It opened up its patents to competitors. It did so because car technology is stuck. Tesla has done a lot to advance the electric car, but not enough to make electric cars chase gas-powered cars off the road and change the fate of the planet. Tesla CEO Elon Musk wrote of his frustration in his blog: “Electric car programs (or programs for any vehicle that doesn’t burn hydrocarbons) at the major manufacturers are small to nonexistent, constituting an average of far less than 1 percent of their total vehicle sales.” In other words, while Tesla attracts a lot of attention, electric cars are a flop. Tesla needs to rally the industry to come up with a breakthrough, or we’ll drive internal combustion cars until Atlanta becomes a seaside town. The most recent before-and-after technology was the iPhone, introduced in 2007. There had been cellphones before that, but the iPhone is the demarcation between an era of stationary computing and networking and an era of mobile computing and networking. Smartphones are changing the way we do things, and that will continue. And yet the core technology is done. Over. The devices and wireless networks keep improving, but it’s incremental now. If you were to go into a Jack Daniel’s stupor for 10 years and wake up and buy a brand-new iPhone, in all likelihood it would seem familiar. Maybe the Internet of Things, which is still pretty ephemeral for most people, will “happen slowly” and turn into a breakthrough explosion that changes the way we live. Or maybe Hawkins or IBM or someone else will perfect brain-inspired technology that will make computers act like smart, learning personal assistants, handling data in ways never before possible. And still no flying car. The closest we’ve got is a drone delivering an Amazon order. How is that ever going to save the world?